MIT scientists said today they’ve just created one the strongest materials known (ten times stronger than steel, but also one of the lightest, with a density of just 5 percent of that of steel) by compressing and fusing flakes of graphene, a two-dimensional form of carbon. 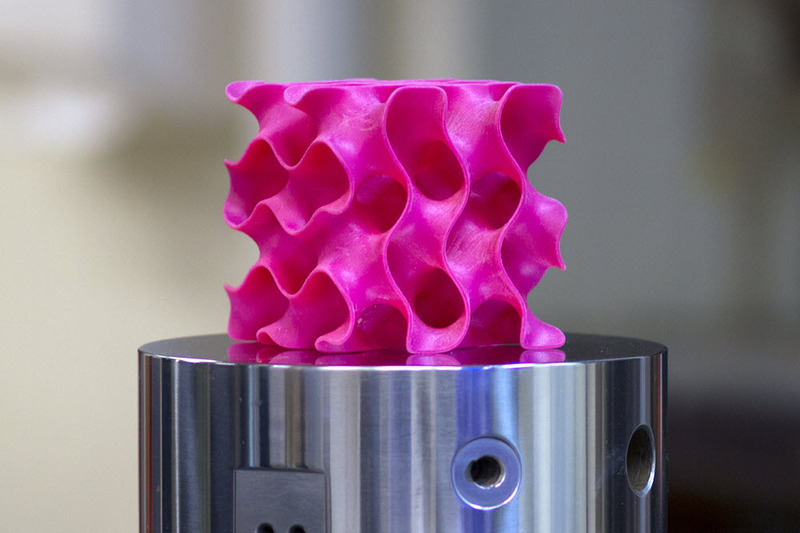 But it’s not about the material itself; it’s about their unusual 3-D geometrical configuration, the researchers discovered. That suggests that similar strong, lightweight materials (in addition to graphene) could be made from a variety of materials by creating similar geometric features. The findings were reported today an open-access paper in the journal Science Advances. By analyzing the material’s behavior down to the level of individual atoms within the structure, the engineers were able to produce a mathematical framework that very closely matches experimental observations. The solution for compressing small flakes of graphene turned out to be a combination of heat and pressure. This process produced a strong, stable structure whose form resembles that of some corals and microscopic creatures called diatoms. These new shapes, which have an enormous surface area in proportion to their volume, proved to be remarkably strong. Buehler says the process resembles what would happen with sheets of paper. Paper has little strength along its length and width, and can be easily crumpled up. But when made into certain shapes, for example rolled into a tube, suddenly the strength along the length of the tube is much greater and can support substantial weight. Similarly, the geometric arrangement of the graphene flakes after treatment naturally forms a very strong configuration. The unusual geometric shapes that graphene naturally forms under heat and pressure look something like a Nerf ball — round, but full of holes. These shapes, known as “gyroids,” are so complex that “actually making them using conventional manufacturing methods is probably impossible,” Buehler says. The team used 3-D-printed models of the structure, enlarged to thousands of times their natural size, for testing purposes. For actual synthesis, the researchers say, one possibility is to use the polymer or metal particles as templates, coat them with graphene by chemical vapor deposit before heat and pressure treatments, and then chemically or physically remove the polymer or metal phases to leave 3-D graphene in the gyroid form.